" Sure accident wan ! " And caring being a Malaysian thingy, we will always slow our cars down to see if the driver or drivers involved in the accident is alright. Actually that is usually not the case to be. 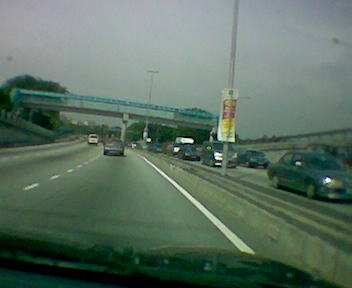 Most Malaysians rather become kay pohs, slow their cars down, and they go, " Eh !! can you see the number plate ar ? Later we go buy 4D." 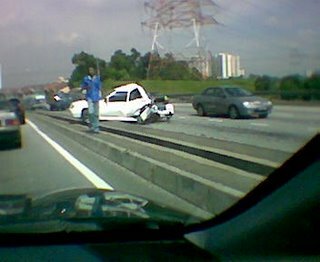 Sometimes when there is a pile up, some of us Malaysians stop their cars by the roadside and form a gallery behind the cars. The way they arrange themselves behind the wrecked cars are exactly like what we could see in Pasar Chow Kit or Masjid India , when some wise old man, have some traditional medicine to vend. Sometimes they form themselves up in a U-Shape Arrangement, just like when Tiger Woods is about to Tee Off. Because of that, you get everyone slowing down, at least to take a peek at the licence plate first, then check got any blood or not. Terrible la. Cause unnecesary traffic problems for our roads only. So I decided to snap one more photo about 100m down the road, to show you how bad the jam was. By now the traffic on my side cleared already, and it is clear nothing was blocking the traffic for my side of the road. The only thing blocking us was nosy Malaysians who had to slow their car down to take a peek at the accident across the road. Walane Beh Tahan. In actual fact I got stuck in that traffic because some, or most Malaysian drivers want to kaypoh. I remember, once, my brother called me up in the wee hours of the morning. So I picked up the phone and he asked me, " You sleeping ah ?". "NO la, why ?" I replied. " Can you come get me, I kena car accident la ?". "Where?" he quickly gave me the details of where the accident took place. So as I made my way to the crime scene I could see one car over turned, one car badly damaged and stuck to a lampost (my bro's car) and another car. On top of that, you could see 4 tow trucks parked at the side of the road, 6 police officers and easily 200 people wandering aronud the crime scene. I almost thought that it was a rock band giving free concert on Fed Highway or something like that. It was not like they were helping to clear the roads, or helping the officers with clearing of debris, etc. Instead of helping, they just made the whole thing got worst. Their cars obstruct traffic, thus slowing down by passing traffic. I dunno why la, but its an eye sore to see Malaysians like this. Sure kena kutuk 9 9 by other people wan. Can't we just mind our own business and drive on so that we do not slow down the traffic behind us ?